I’m so lucky that I have such a big, sunny garden, but I’ve also come to realize that not being limited by space can be more difficult than having to squeeze things into a small area. Ethan called my garden plan this season “masochistic” after he offered to help and i told him what my goals were for the day. The summer season this year was so disappointing that i gave up half way through and started thinking about the fall and winter garden, and it got much too complicated. This season I’m hoping to accomplish what I’ve always wanted to do – plant the entire 3/4 of an acre in vegetables, grains and flowers. I love that about gardening – despite the weather or bugs or mildew etc, there’s always the chance to start again fresh, with wisdom from the last season under your hat. The pigs have happily done the difficult and tiresome job of clearing out the jungle of summer with snout and trotter. It always amazes me how quickly they work a tangle of 8 foot tall impenetrable woody weeds into fluffy garden soil, ready to be planted. Besides, the girls are helping in the garden for homeschool this season. 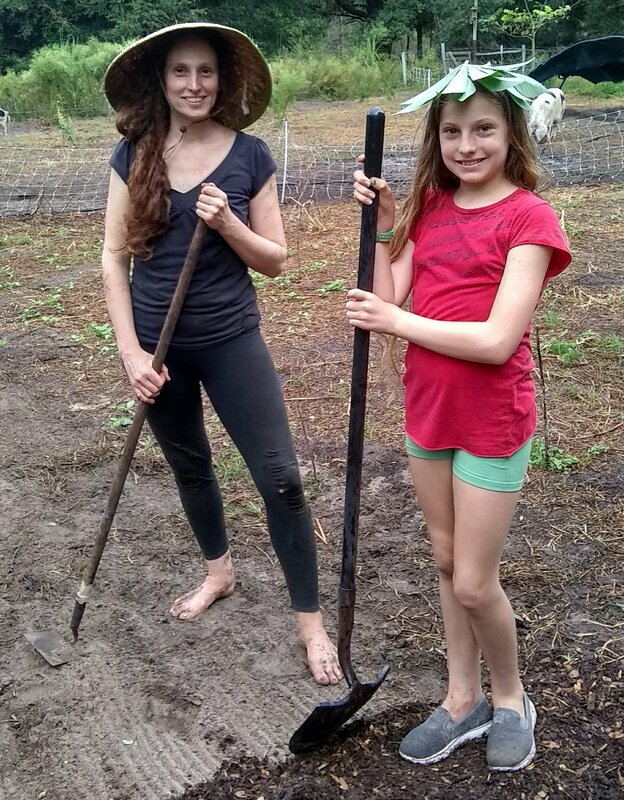 We’re donning hats and shovels and calling it a botany block, because there is so much to learn from seeds and flowers and roots. Not only botany but also the stories of people and plants, insects and predators and microbes, death and decay and rebirth. Sometimes it seems to me that all of life is contained in some form in the garden, this ancient symbol of our beginning. 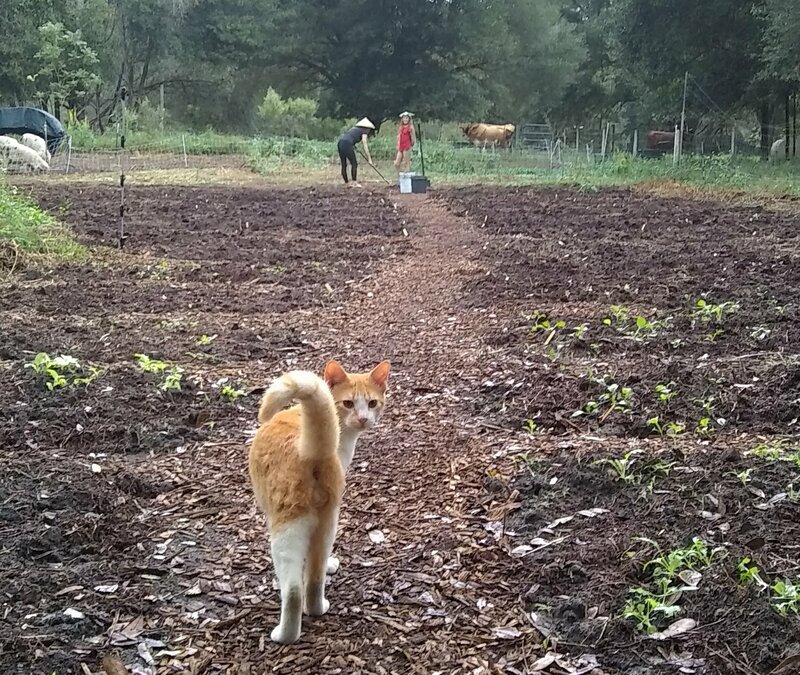 All that’s left for us to do after the pigs have been through is to mark out beds with mulched paths, work in some compost, and plant the seeds or starts. It’s like building a little city and deciding where each neighborhood of plants might do best. We have been marveling at how everything starts off so small and gradually fills all the space with shades of gentle green. 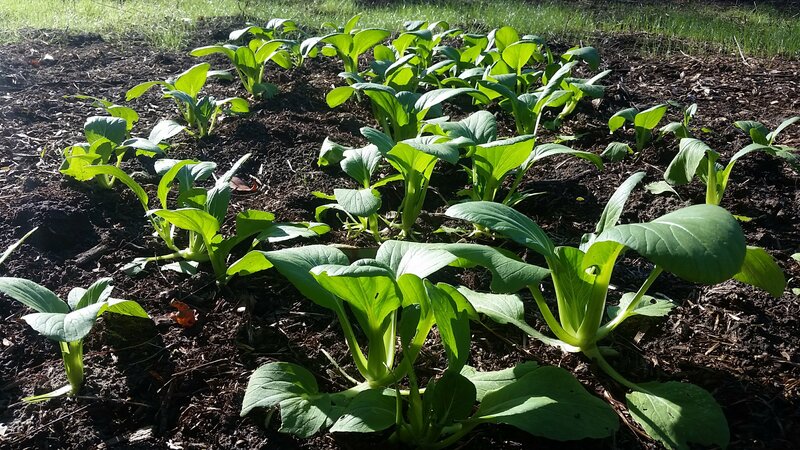 Are you wondering what we are growing in our crazy garden this season? Mustard and Asian Greens: Bekana, chin-chang cabbage, Tatsoi, pak choy, choy sum, Mizuna, Komatsuna, bok pak choy, ruby streaks mustard, Chirumen Hakusai, Tainong Emperor heading mustard, Feaster family mustard, Maruba Santoh, Gailaan, red choy, and Napa cabbage. Kohlrabi: early purple Vienna, Superschmelz and Winter Gigant. 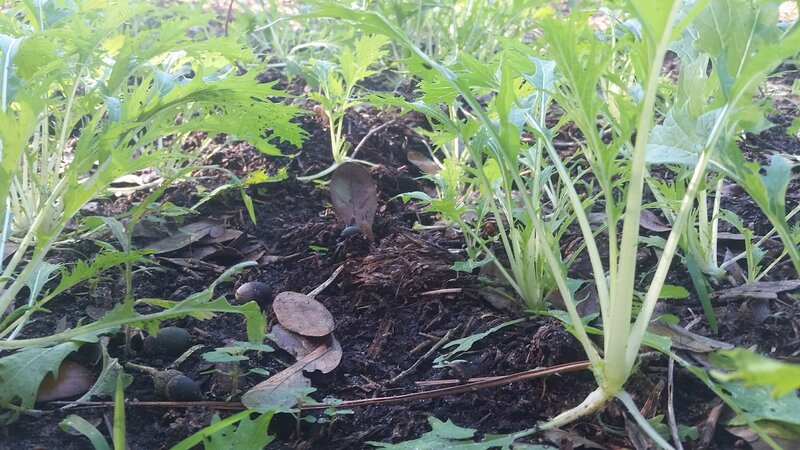 A Kale Trial: Scarlet, Siber-frill, Adaptive seed’s Kale Coalition, Blue Curled Scotch, Lacinato, Vates, Tronchuda. Herbs: Cilantro, parsley, lovage, dill, fennel, fenugreek, chervil. We have an experiment with artichokes and cardoon – I’ve never grown either of them but I’ve always wondered if i could. Another attempt this year at a trial for collards: Alabama blue, white mountain cabbage collards, variegated collards, tall marrow stem, Groniger blue, Vates, Hen Peck, Even’ Star landrace, and green glaze. The chickens ate them last year. Some interesting Broccoli and Cauliflower to trial: Purple Cape broccoli, Green Goliath broccoli, Piracicaba broccoli, Spigariello, and purple sprouting broccoli, snow ball cauliflower, Pusa Meghna cauliflower (super early maturing apparently), Violetta Italia cauliflower. Radishes: Misato Rose, plum purple, and 4 different daikon radish from different seed companies to see what differences there might be, a locally bred purple daikon. Spinach and chard: Monstreux de Viroflay and bloomsdale spinach, Joy’s midnight and rainbow chard. Turnips: Purple Top, Wonnegold, and Hida Beni red turnip. Carrots: Oxheart, Purple Dragon, black nebula, Lobbericher yellow, and the Pusa Rudhira seeds I’ve saved for seasons now. Plus strawberries and onions in abundance in the back of the garden! Cabbage: Quintal D’Alsace, January King, Winter King, Red Acre, and Perfection Savoy. Brussels Sprouts: Long Island Improved and Red Bull. Beets: Shiraz, Detroit Dark Red, Okragly Ciemnoczervony, giant yellow Eckendorf, and 3 root grex. Lettuce: Sword Leaf, Nevada, Rouge D’Hiver, Ear of the Devil, Drunken Woman, Key Lime, Bronze Arrow, Sanguine Ameliore, Grandpa Admire’s, Beleah Rose, Yugoslavia Butterhead, Blonde Du Cazard, Reine Des Glaces, Crisp Mint, Celtuce, and sorrel and arugula though not actually lettuce they are still salad greens. I saved a lot of seed from last year’s trial, which is why i have so many varieties. Parsnips : Harris Model and Halblange Wiesse. Before you think I’m insane, remember that this garden encompasses Fall, Winter and Spring, with different plantings as the weather cools for short and long season plants that like cooler weather. 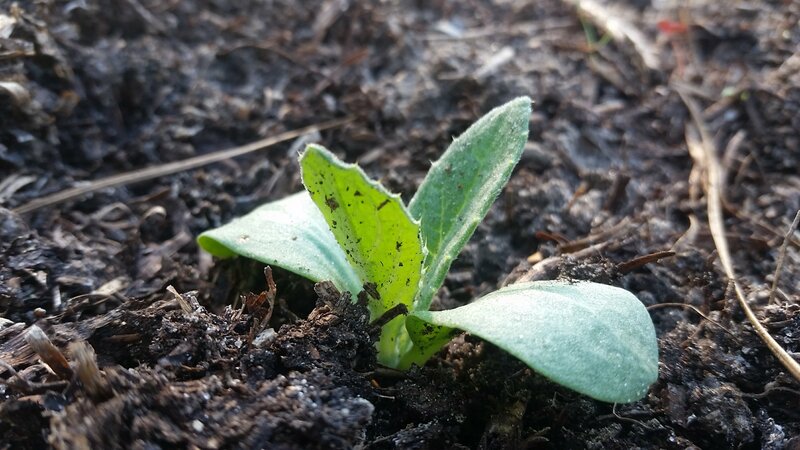 And I usually don’t write about exactly what I’m planting because it never all works out. Then you might wonder what happened to the broccoli trial? And it would all have perished in a frost, or been devoured by goats and caterpillars at the same time, or been scratch victims of the terrible chickens. Yes, I’ve definitely decided that space limits in gardens are a good thing, especially if you are easily tempted by seed catalogues, but at least it is a lot of fun! It’s half way planted so far and i haven’t keeled over in the kolhrabi yet. I can’t wait to see how it all grows this year. My garden was in such a steep part of the Santa Cruz Mountains that there was less flat space in nine acres than there was in my former suburban parcel. My colleague in Los Angeles does more with his small city lot. How embarrassing. That’s hard with elevation like that! I know, a friend of mine was just saying, “our garden is so much smaller than yours but we still get so much out of it!” I told her she just realized i am a lazy gardener! It’s just different having a small space where everything must be carefully and efficiently tended to get the most out of it, or a large space you can let ramble and do its own thing. I plant 18 cucumber plants every summer and don’t do anything except turn on sprinklers and i get WAY more cucumbers than i ever need. But i have the space that makes it easy to plant that way. It doesn’t matter if some die or there are pests, and then i can save seed from a decent genetic pool too. But of course a tiny space can produce just as much, but i would have to prune the vines and care about them! Yes, in town, we used all the space available, and grew pole beans on strings on the fences. 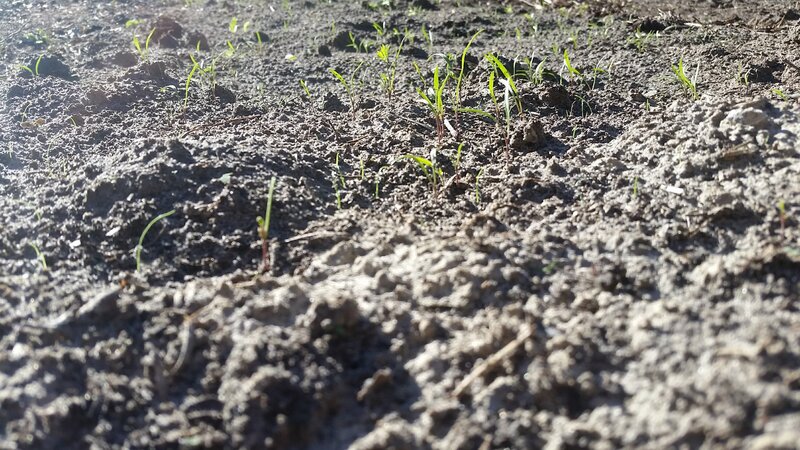 Of course, we also had excellent soil, flat ground, and plenty of sunlight! It was rad! I love easy-to-garden situations! But how often do you have that in life? Small parcels in town are easier to garden with, but I still find ways to complicate them. Lol! I guess i could probably manage to also. Enjoy the rest and fun time to dream about next season! I find it challenging in a year-round garden latitude because i never get a nice long break, hence the disappointing summer garden this year when i felt like i needed to slouch a bit gardening-wise.